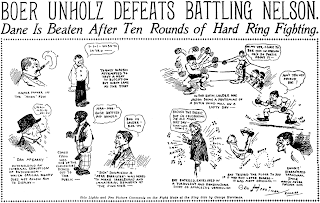 Tuesday, February 4 1908 --The Unholz-Nelson fight is today, and in Herriman's Today in Sports feature he eschews the usual round-up approach to his coverage and concentrates the whole space on this boxing story. 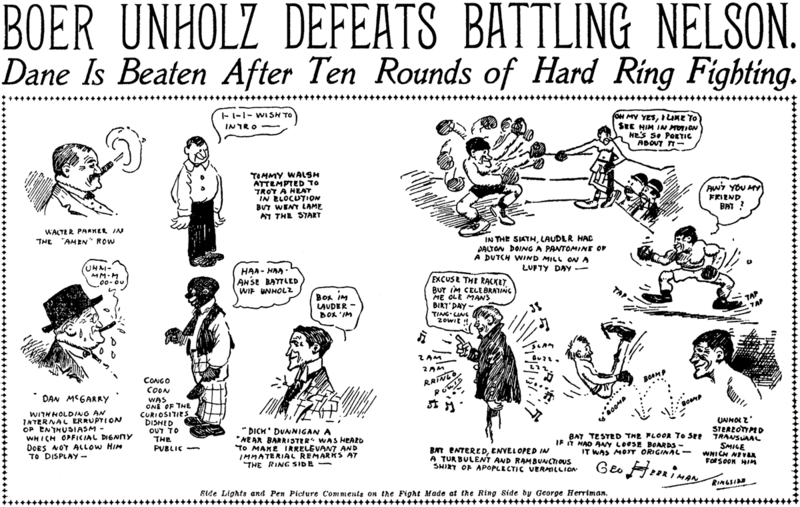 Wednesday, February 5 1908 -- The fight is over and Unholz has bested Battling Nelson in a 10-round decision. Nelson went to the mat in the first, but there is question about it being a slip than an actual knockdown. According to observers, Unholz did make a great showing, and despite the winner being unofficial (a city ordinance somehow forbade it), there was no question of which of the two had earned a shot at Joe Gans. However, both fighters would end up in the ring with Gans before the year was over. Benjamin Sayre Cory Kilvert was born in Hamilton, Ontario, Canada on April 14, 1879, according to his World War II draft card. Kilvert's son, Benjamin Sayre Cory Kilvert Jr., wrote, "As a very young man, Kilvert left Canada to study at the Art Students' League in New York City, where his instructor was Robert Henri….Kilvert was extremely well known for his illustrations that appeared in many books and magazines in both the USA and Canada from approximately 1902 to the mid 1930's." Kilvert's illustrations of children were highly praised in The American Printer, December 1902 issue. It may not be a difficult task for an artist to limn the figure of a child, but it is quite a different thing to draw children as B. Cory Kilvert draws them. This young artist delineates the soul as well as the material, and his work promises to make his name famous. His drawings in each instance reflect the child-soul of his model. He could hardly have selected a field that is more difficult to the average artist. Mr. Kilvert has done other work and well, but in none does he seem so gifted as in this portrayal of child character. It was really his depiction of the mischievous boy that first brought him to the attention of the art world, in which he has since played a conspicuous part. His realization of the juvenile is natural, and consequently shows much of what may be termed originality. Instead of striving for some ultra effect, Kilvert draws children as they exist, and draws them artistically, adding, perhaps, a capricious sentiment of Kilvert that does not detract, but accentuates, the reality of the drawings. That Kilvert has made a study of his subject must be evident to any one who ponders his work. That he is the closest of students is shown in each of his drawings, but that he has a natural talent for this important feature of his work cannot be denied. He is a mere youth himself, and has always had a big, soft spot in his heart for children. True he has studied them and their inconsistent characteristics, but never without a real interest in the children themselves. The result is that he draws as he knows the child to be, and delineates the child-soul as he has found it, and his work is clever and unique and ingenious, and always truly artistic. He has nor endeavored to create a new type that one would call the "Kilvert boy" or the "Kilvert girl." He has satisfied himself with Nature's creation and has given it to us, and we are pleased because he has done so. Nature is a great artist, and her work is difficult to improve upon. Kilvert realizes this fact. Each piece stands for some phase of child-life that none can fail to appreciate, even if one is naturally not of a very artistic bent. B. Cory Kilvert is young and will certainly place himself among the celebrities of his field. He is a native of Canada, having been born in Hamilton, Ont., in 1879. It is said that he was a mischievous boy himself and got into more than one scrape for drawing caricatures of his schoolmates. Three years ago  he joined the art department of the New York Evening World, which he left to accept a place with Harper & Brothers. Recently he has been free-lancing, his work appearing in Harper's, Collier's, Outing, Frank Leslie's Monthly and the Metropolitan. In the last-named magazine much of his child-work has appeared, Editor Maxwell, a well-known art connoisseur, being much impressed with young Kilvert's drawings, of which he said, "Each is a miniature history of the race and each a thing of cleverness and beauty." The line which is Kilvert's specialty has practically no limit. 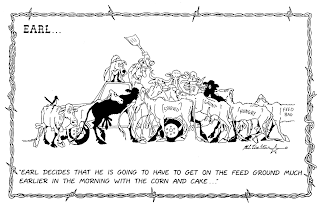 Already he has studied the characteristics of the children of other than American nationality, and he draws them in the same clever manner that he does Michael Dooley or the others shown here. 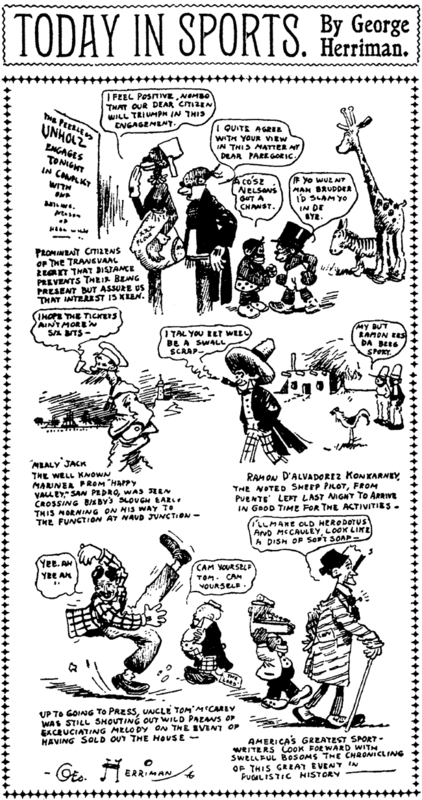 Kilvert's comic strip Buddy Spilliken's Diary was published from October 11 to November 29, 1908. In the 1910 U.S. Federal Census, Kilvert, his wife Elise, daughter Dorothy and a servant lived in Woodbury, New York on Pine Hill Road. He had been married a year and his occupation was artist. 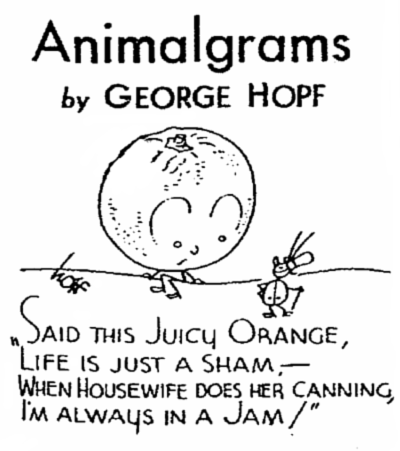 His comic strip Dorothy and the Killies was published in the New York Press from 1914 to 1915. 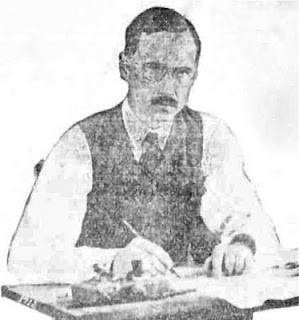 On a return trip from Canada, visiting his mother in March 1919, Kilvert's address was recorded in the manifest as 50 West 55th Street, New York, New York. The Kilverts lived in Washington, D.C. at 1627 New Hampshire Avenue as recorded in the 1930 census. He had divorced first wife and remarried, around 1928, to Helen; they had two children, Janice and Cory B. Jr.
Kilvert signed his World War II draft card on April 27, 1942. He lived in Manhattan, New York City at 130 East 67th Street and was self-employed. His description was five feet, eleven-and-a-half inches, 180 pounds, with blue eyes and brown hair. The New York Times noted his passing on March 31, 1946. 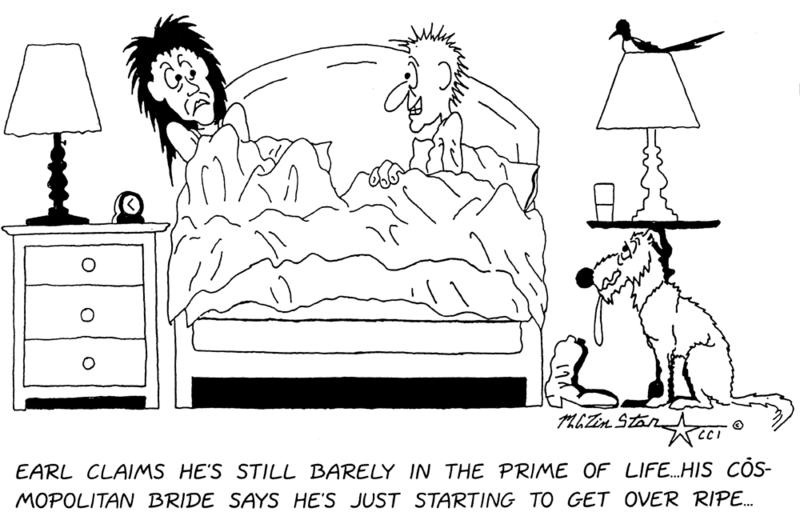 Benjamin Sayre Cory Kilvert of 876 Park Avenue, an artist whose humorous cartoons formed a feature of the original Life magazine, died here Friday [March 29]. His age was 65. Born in Hamilton, Ont., Mr. Kilvert came to this country in 1900 and studied at the Art Students League. He illustrated many children's books and at one time was a member of the staff of The World. He was a son of Francis Edwin Kilvert, former Member of the Canadian Parliament and Collector of Customs of Hamilton. He leaves a widow, Mrs. Helen Foss Kilvert, formerly of Nyack, N.Y.; a son, Benjamin S.C. Kilvert Jr., and two daughters, Janice Kilvert and Mrs. Jonathan Duncan. A biography of Kilvert, written by his son, can be found at Genealogy.com's GenForum. 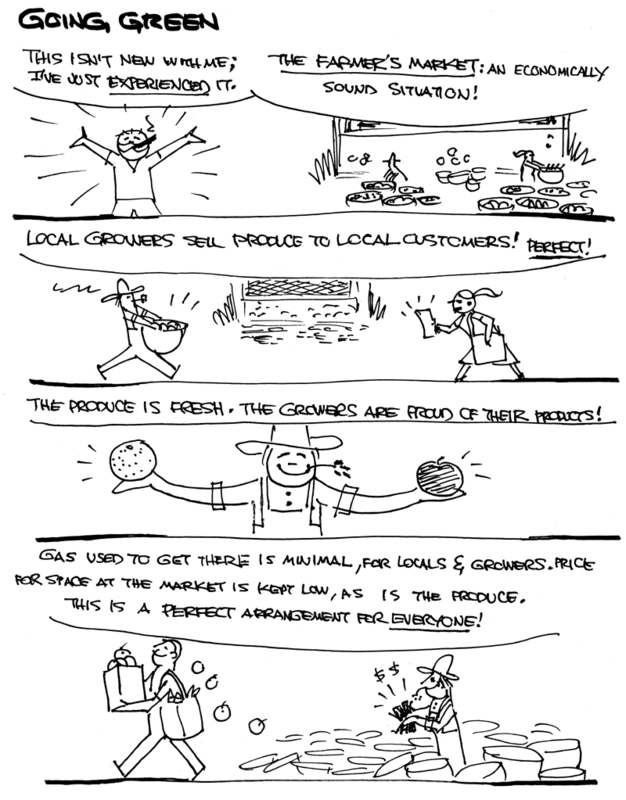 Some of the hardest features to track down are those that are self-syndicated to smaller rural papers. It's surprising how many are lurking out there, flying under the radar, sometimes for decades at a time. One that I just discovered recently is Earl, a very funny panel that was sold mostly to rural weeklies out west. The star of the show is a modern day cowboy who suffers the trials and tribulations of ranch life in a way that can produce laughs even for a city slicker like me. 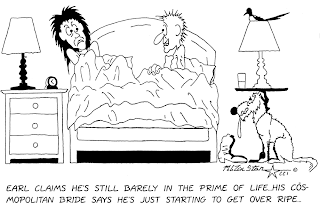 Some of my favorite Earl cartoons are those featuring the 'Cosmopolitan Bride', Earl's newly wedded wife from the big city. There's also the unusual motif of 'branding' many of the animals with descriptive names, a cute little conceit that works surprisingly well. 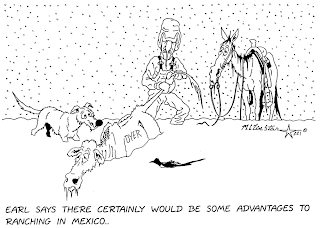 The art is a little rough, but I think the humor more than makes up for it. 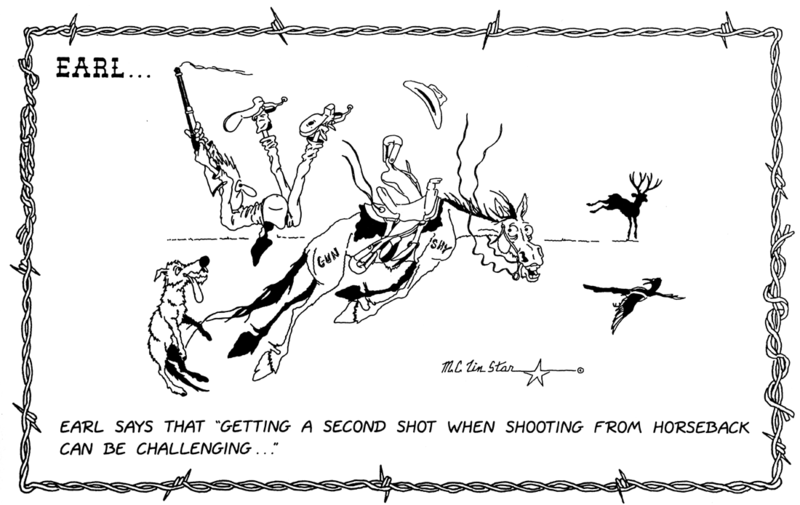 The creator, a real life cowboy, is Wally Badgett, but he signs his work M.C. Tin Star (the M.C. stands for Miles City, Montana, of which he was sheriff for a time). The only newspaper samples I have of the feature are from 1997-99 in the Circle (MT) Banner paper, but the series must have started earlier as the first reprint book of the feature was out by 1995. Reprint books of Earl must sell pretty well because there have been a total of fourteen of them, the latest published in 2004. I don't know if Badgett is still actively selling Earl as a newspaper feature, but he does still have a website for selling books and calendars. Stewart Carothers, of Chicago, formerly of Fayetteville, is the author of the Charlie Chaplin [sic: Chaplin's] Comic Capers, which are now appearing daily and Sunday in sixty metropolitan newspapers in the United States. 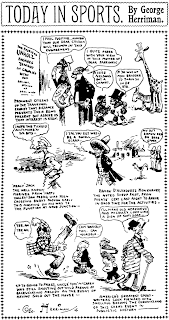 Besides the daily Charlie Chaplin comic strip, Mr. Carothers has a full page in colors in each Sunday issue of the Chicago Herald, portraying the antics of the movie comedian of international fame, Charlie Chaplin, and another of his creations, The Haphazards of Helene [sic: Movies of Haphazard Helen]. The Chicago Herald has the copyright for the Charlie Chaplin Comics, and is said to be deriving a handsome profit from the sale of exclusive rights to the feature. Mr. Carothers is now well up on the salary list of the Herald staff, being second only to the sporting editor, the city editor and the managing editor. Mr. Carothers attended the public school of Fayetteville and was later a student in the University. His cartoons have appeared in a number of issues of the Cardinal, the University Annual. His brother, Neil Carothers, is Associate Professor of Political Economy and Sociology in the University of Arkansas. 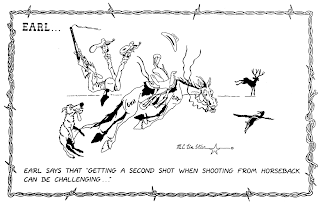 Stewart W. Carothers, Herald cartoonist, who drew the Charley Chaplin pictures, was killed early this morning by falling out of a window at De Jonghe's hotel. His body was found at 3:30 o'clock by Policeman Fisher, who was walking through the alley in the rear of the hotel. R.A. Skinner of 4441 Walden street and H. Bergum of 912 North Mozart street were with Carothers during the night. They went to De Jonghe's about 1 o'clock, where Skinner and Bergum registered. Carothers accompanied them to their room on the fifth floor. Carothers was invited to remain in the room on account of the lateness of the hour. Skinner and Bergum occupied the bed, and Carothers laid down on a couch. How he happened to fall from the window is not known. Skinner and Bergum did not know of his death until informed by Lieut. James McMahon. Policeman Fisher said he walked through the alley at 2:30 o'clock and the body was not there at that time. On his next trip he stumbled against the body that lay on the cement pavement at the north end of the hotel. Will Be Buried in Mississippi. Mrs. Neil Carothers Goes to Starkville to Attend Son's Funeral. Austin, Texas, Oct. 5—Mrs. Neil Carothers, director of the woman's building of the University of Texas, accompanied by her daughter, Miss Katherine, left today for Starkville, Miss., to attend the funeral of her son, Stuart W. Carothers, who was killed yesterday by falling from the fifth story of a hotel in Chicago. Mrs. Carothers was advised by telegraph yesterday of the accident and instructed that the body of her son be taken to Starkville, Miss., for internment. At the time of his death Mr. Carothers was employed on the Chicago Herald as a cartoonist and was making rapid headway in his profession. While a student in the Austin High School he gained distinction among the students for his ability to do free hand drawing. Finishing his high school course, he attended the University of Arkansas at Fayetteville, where his brother, Neil Carothers, was teaching and who is now a teacher at Princeton. Going to Chicago three years ago he took a course in the Chicago Art Institute. Starkville, Miss., Oct. 8.—The body of Stuart Carothers, whose death occurred in Chicago early Monday morning resulting from a fall from a fifth-story window of his hotel, reached Starkville Wednesday night and was taken to the residence of Prof. A.M. Maxwell, his uncle. His mother, who is in charge of the Woman's Building of the University of Texas, arrived early Wednesday. The funeral service was held at the residence of Prof. Maxwell. Rev. F.Z. Browne, pastor of the Presbyterian Church, assisted by Rev. W.A. Jordan and T.H. Lipscomb, officiated. The interment was in Odd Fellows cemetery. 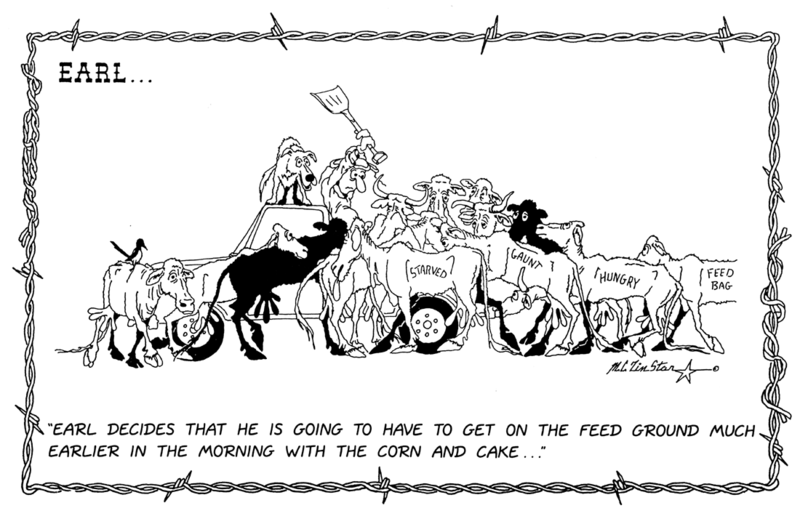 Carothers' last Charlie Chaplin strip. Doing some genealogical sleuthing, and discovered that this man was my great uncle. 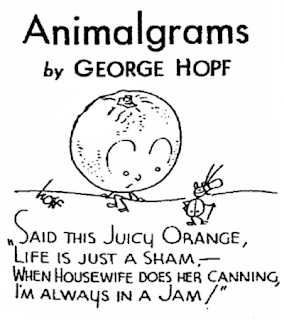 Last week Alex Jay posted a bio of George Hopf which cited his return to newspaper comics in the 1930s with a feature called Animalgrams. I had never seen this feature, and added a comment that I could not vouch for its existence. So naturally a bunch of good folks had to point out how woefully underinformed I am. Properly chastened, here's a few samples of Animalgrams submitted by Alex Jay. 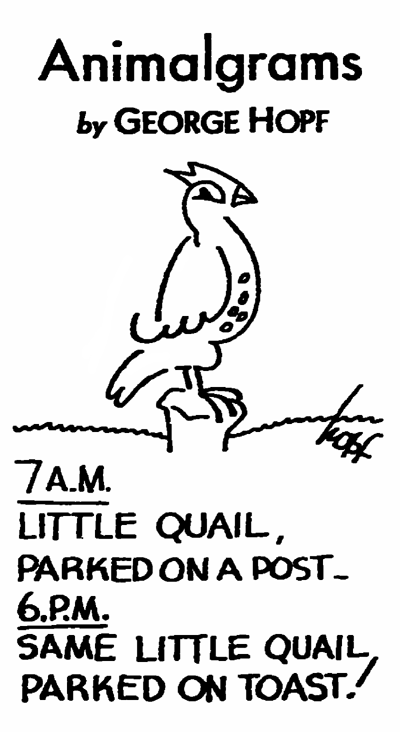 These appeared in a New York Herald-Tribune-distributed Sunday magazine section titled This Week. The magazine was copyrighted to a United Newspaper Magazine Corporation, presumably a company associated with the Herald-Tribune. It's a good thing these panels are bylined, because Hopf's signature on these could easily be mistaken for that of Syd Hoff. 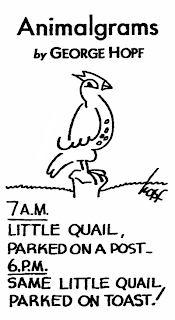 Alex Jay says that Animalgrams ran in This Week (as seen in the Cleveland Plain Dealer) from January 31 1937 to June 12 1938, the longest run found to this point. Thanks to all who wrote in with information about the run of this little oddball item! Please let Jim know Doralya and I are going on a cruise next weekend which means more cigars coming his way!